Our "April" Centerpiece Kit on a height adjustable Chrome Riser features our beautiful "April" Chandelier sitting atop our High Rise Chrome Riser and the combination is absolutely stunning! The chrome riser is adjustable to 5 different heights from 22" to 65" so this awesome duo looks just as spectacular on the table as it does on the floor! Use the two pieces together, or use apart! The Riser that you get can be used SO many ways! When you buy the Riser and the Chandelier together in this kit, you save $$. Plus, you get a couple of Double-Duty Super High Quality pieces that you can use over and over again. 1) April Chandelier with 3 sparkling tiers of pure deliciousness! Clear multi-faceted acrylic octagons and a lovely 2" pendant at the end of each strand. 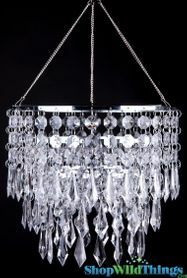 The chandelier is 10" from the top ring to the bottom bead and it comes with a hanging chain if you choose to hang it. 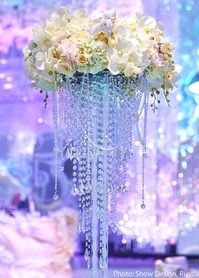 The overall hanging height is 15" including the chain. 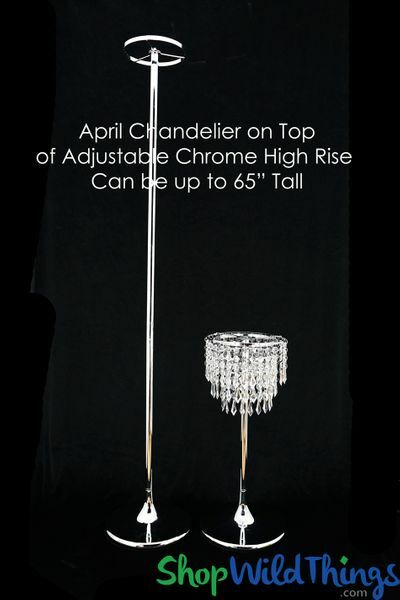 2) "High Rise" Centerpiece Riser that is ADJUSTABLE and has a spectacular shiny chrome finish! This riser can be used at 5 different heights from 22" tall to 65" tall. Using the different sized poles by themselves or with the other poles, the riser can be 22", 25 1/2", 41 1/2", 45 1/2" or 65" tall. You will receive an assembly instruction sheet describing how to achieve each height - no tools needed. The round centerpiece holder is 8" in diameter and has 3 cross-bars to hold the April chandelier or any other centerpiece item. In addition, the base on this riser is 11 1/2" in diameter and the entire riser weighs 8 lbs. Sturdy and stable - a riser you can count on whether you want to use it for a table centerpiece display or as a floor display! Another plus to the riser is that there are 34 tiny holes around the holder, each 3/4" apart, so if you choose not to use the April chandelier, you can use jump rings to add bead strands or garlands to change up the look! For easy transportation and storage, this riser breaks down into 5 pieces which easily screw together. You might also consider placing our LED Saucers on top of the chandelier and the lights shining down against the crystal beads really makes an impressive statement! We have standard White LED Saucers or you can use our Colorful LED Light Saucers on top to change the color of the chandelier to match your event. Risers are quick, convenient and invaluable at weddings, showers or events and whether you choose to use April and the riser together or separately, you'll be sure to be using these classy accessories over and over!